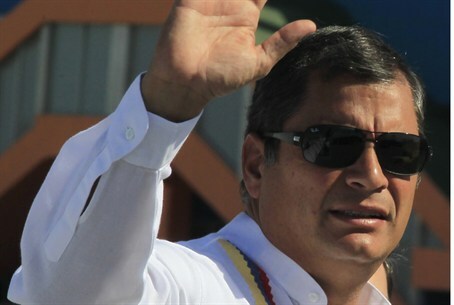 Ecuadorian President Rafael Correa caused a firestorm Thursday, after he tweeted "Heil Hitler!" during a political debate. Correa's tweet was in response to Panamanian politician Guillermo Cochez, who tweeted the first line from former Ecuadorian President Osvaldo Hurtado's speech last week calling Correa "fascist." Correa's response, meant as a tongue-in-cheek way of responding to that claim, is just one of many spotty tweets. In another days later, he referred to US President Barack Obama under questionable terms, stating, "it is worrisome that an Afro minimizes history." Correa has a long history of anti-Israel moves, as well. In August 2014, he cancelled a scheduled visit to Israel due to “Israeli attacks against the Palestinians” - Israel defending its citizens during Operation Protective Edge in Gaza. And in 2012, Correa downplayed the 1994 AMIA bombing which killed 85 people. Ecuador later denied the remarks.